FIX: Dell Laptop Needs the Bitlocker Recovery key (Solved). Recently, one of my customers, brought his Windows 10 Dell laptop to our service, with the following problem: When the laptop starts, it prompts to enter the BitLocker recovery key, but, as my customer says, it has never enabled the BitLocker encryption on the system. After some research on the Internet, I found that on some Dell devices the bitlocker is starting automatically to encrypt the drive if a Microsoft Account (MSA) is used on the system. In other cases, some users complained that the Bitlocker encryption was enabled automatically, after updating the BIOS on their Dell laptop. In this tutorial, you 'll find all the available methods to remove the Bitlocker Drive Encryption in Windows 10. Related article: How to Encrypt Drive C: with BitLocker in Windows 10 Pro & Enterprise. How to Remove Bitlocker Encryption in Windows 10. Case 1. How to Disable Bitlocker Encryption If you can login to Windows 10. 1. Navigate to Windows Control Panel and open System and Security. 2. At 'Manage Bitlocker' section, click Bitlocker Drive Encryption. 3. Click Turn off Bitlocker on the encrypted drive. Case 2. How to Disable Bitlocker if you Cannot login to Windows. Step 1. Find the Bitlocker Recovery key. On your Azure Account if you sign in with an Azure Active Directory account. 2. If you find the recovery key, proceed to step-2 below, otherwise proceed to step-3. Step 2. Unlock the drive by Entering the Recovery key. Option 1. Attach the encrypted drive on another Windows 10 PC and then double click on the drive and type the recovery key to unlock it. After unlocking the drive, follow the instructions at case-1 to turn off the bitlocker encryption. 1. 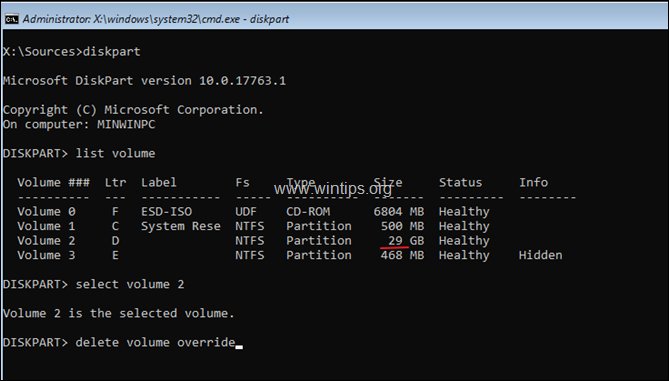 Boot your system from a Windows 10 Installation Media (USB or DVD). 2. At the first screen click Next and then Repair you computer. 2. In the screen you asked for the recovery key, click Skip this drive. 5. Once you find the drive letter of the encrypted drive, give the following command to unlock the encrypted drive by using the recovery key. 9. Finally, give again the "manage-bde -status" command and verify that the Conversion status is Fully Decrypted. 10. When done, remove the Recovery Media and reboot the computer. Windows should start normally. 3. After login to Windows, proceed to deactivate the Bitlocker encryption, by following the steps Ii n Case-1 above. * Attention: The below procedure applies only on Dell laptops. If you don't have a Dell laptop, then skip to Step-4. 1. Power on your laptop. 2. When you see the Dell logo, press continuously the F2 key to enter BIOS Setup. 3. At Boot Sequence options, select UEFI and click Apply. 4. At Security options, select the TPM 2.0 Security and set it to Enable. Then click Apply again. 5. At Secure Boot options, set the Secure Boot to Enable and click Apply. 6. Click Exit to restart the system and see if you can boot to Windows. Step 4. Completely Erase the Bitlocker Encrypted Drive and Reinstall Windows 10. If you cannot unlock the drive, by using the instructions above, then the only remaining way to use again your computer, is to remove the Bitlocker encryption by completely erasing the encrypted drive and then to reinstall Windows 10. That means that you will lose all of your stored data. So, continue below, only if you can live with that decision. 3. In the screen you asked for the recovery key, click Skip this drive. 6. At DISKPART command type type the following command to list all the volumes on the system. 9. When the process is completed, type exit to close the DISKPART utility. 10. Restart your computer and boot again from the Windows installation media. 11. Proceed to perform a clean Windows 10 installation, by following the steps in this article: How to clean install Windows 10 on your Desktop or Laptop PC. « How to Encrypt Drive C: with BitLocker in Windows 10 Pro & Enterprise. » How to Uninstall Updates in Windows 10/8/7 OS.